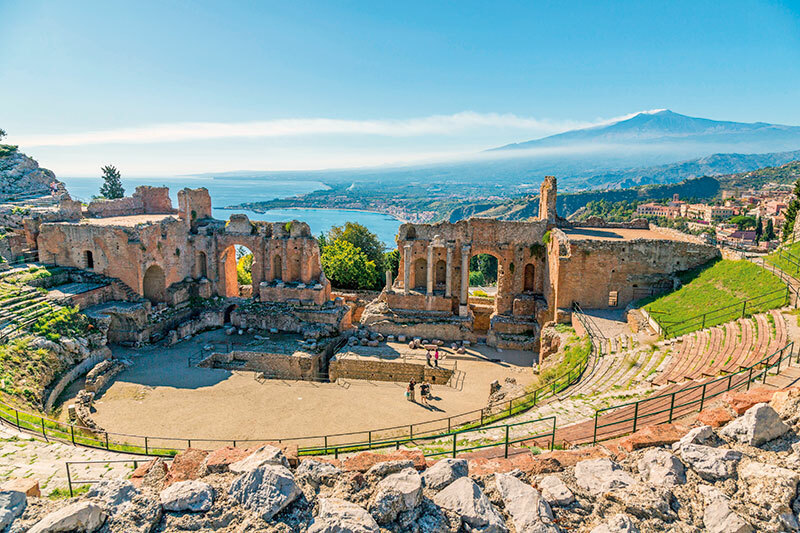 Every day in Sicily is like Christmas Day, and most certainly over the New Year, as UNESCO World Heritage sites that dot this remarkable island languish and the spectacularly good Sicilian wine matures. At midnight, I descend upon Taormina, that hill-perched fairy-tale town that fortune’s favoured with grace. That for Taormina’s duomo I’d forsaken the exalted Mass at Malta’s fabled St John’s Co-Cathedral, I’m dismayed. The duomo is slight, stark and embellished by the town’s grande dames parading hefty furs and lasses flaunting exiguous skirts. And if I thought excitingly the bonfires outside were mafia mayhem, it’s only tradition. There’s no mafia. Devastating. Dawn, when the mists curl over the monumental snow-cloaked Mount Etna, all misgivings dissolve. From the terraces at the legendary San Domenico Palace Hotel (a converted Dominican monastery), emerald hills look down to sapphire waters. Ah! I’m transfixed but also late for breakfast, a veritable cornucopia including Sicilian almonds the size of islands. Then to the Greek theatre. This one’s location staggers. The drama isn’t on the stage but in the backdrop as Mount Etna looms theatrically like a pristine white sword searing the tenebrous darkness. Museums seem shut indefinitely. Churches, some, are open. Wandering this prettiest of towns with its cascading steps, luxury boutiques and gardens with orange-laden trees consumes my afternoon. The public gardens exhibit accoutrements of war-recall like the evil inherent in the Garden of Eden. More allegory, as flighty stairs zigzag uphill to a dizzyingly high church and to salvation (if you attain either, for on derelict stairs, death may attain you first). That monasteries can be lavish, establishes Catania’s Benedictine Monastery, an accomplished ode to Sicilian baroque architecture, where extravagant fixtures evince that monks were often nobles who transferred palace luxuries to the monastery…. A modern university integrates fascinatingly into an amalgamation of disparate periods, volcanic eruptions and earthquakes, having ravaged the original in 1558. Stretched outside is the sleekest Mercedes in Sicily. 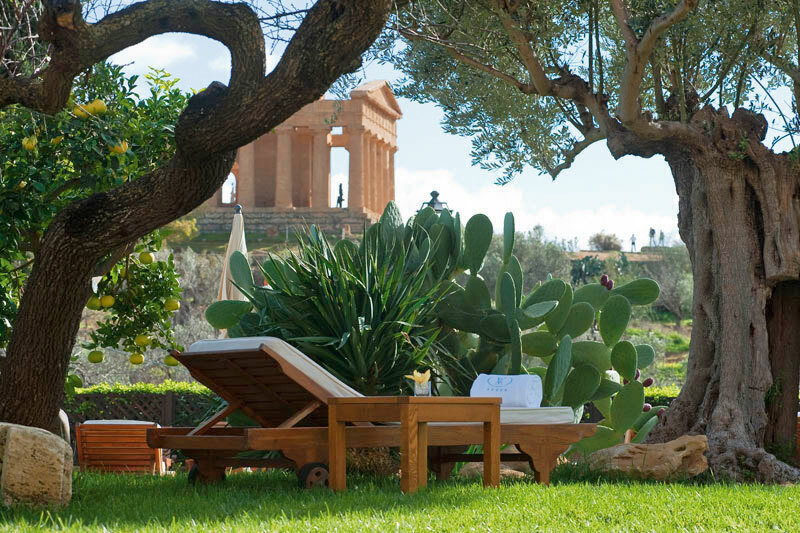 It’s from Rocco Forte Verdura, Sicily’s most glamorous address, more immense than Monte Carlo, idyllically isolated over 270 hectares, the lush groomed lawns of which meld into golf courses frilled by blue seas. They have the phenomenal Sicilian speciality pasta alla Norma and at Zagara, the award-winning sommelier Nando Papa unleashed an astonishing champagne-like Sicilian Prosecco Terrazze dell’Etna Brut. The spa’s superb. From Verdura, I explore Agrigento’s UNESCO World Heritage Valley of the Temples, beginning with the erratically scheduled museum boasting a considerable assemblage of Greek vases depicting chivalrous and some very naughty tales. Villa Athena, an erstwhile villa that used to belong to the aristocracy, happens to be on the site so they’ve got the ancient temples in their backyard, with private access. For this privilege, you have to sup at their dapper restaurant. In Palermo, one man has beaten me to the most luxurious hotels — the Dalai Lama. He graced Villa Igea where royals sojourn. The receptionist appears sporadically so you queue to check in, and luggage retrieval at check out takes hours; they don’t have adapters (my laptop dies), nor a concierge. Sicily is an island and Villa Igea is an island within an island, wrapped in its own myth. On New Year’s Eve, hotels in Sicily are sold out. I’m homeless. 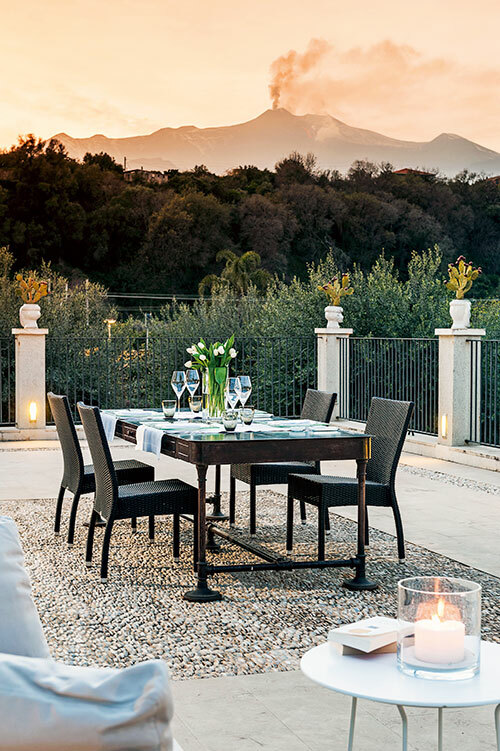 But Alex — from Locanda Don Serafino, the famous twice-Michelin-starred restaurant — the best-connected man in Sicily, finds me not a room but a duplex suite at Donna Carmela, a converted winery, in Giarre, three hours away. No chauffeur works on New Year’s Eve. So Peppe from Essence of Sicily, Sicily’s top tour operator, contrives conveyance, in a Mercedes, and I’m conveyed around Sicily as a girl must be. I see Palermo abundant with gardens, churches, fountains and long palm-fringed avenues, the mighty duomo opulent in baroque architecture. I’m driven past orange-groved vistas, where the fruits peep like a million suns through dense clouds of foliage, to Eremo della Giubiliana, a marvel the Knights of Malta inhabited. The owners, French nobles, have titivated things with a private airstrip whose watchtower is a suite from where you can see Malta. Danielo, the savviest chauffeur in Sicily, drives me like a demon to Syracuse, unique for juxtaposing a white Greek and black Roman theatre. Syracuse Museum amazes: Splendid Venuses abound but dash I must to the exquisite island Ortigia where great charm meets baroque grandeur. There’s a temple of Apollo and an ornate duomo beside the church harbouring a Caravaggio, Sicily being briefly the painter’s quarters. Sicily is thought-provoking. In India, shops and restaurants once devoutly shut for Diwali are now open. Sicilians still live genteelly, valuing family and festivity over finances. It’s so bourgeois to work.